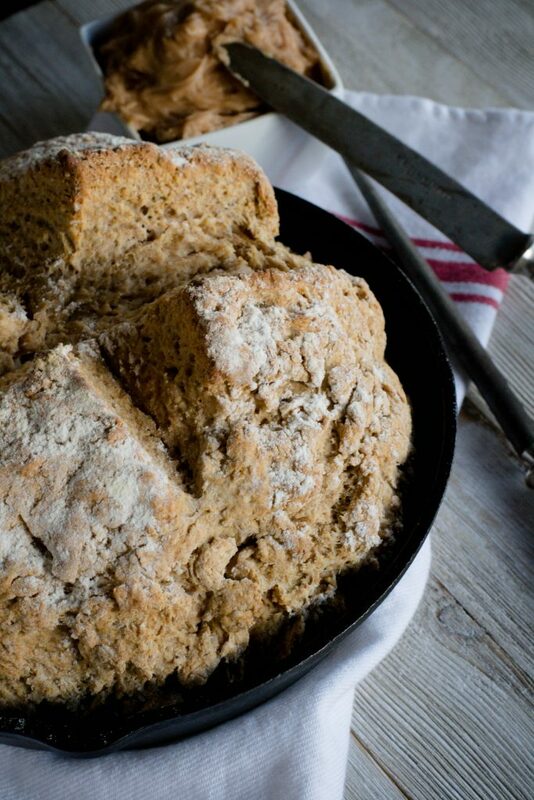 Brown Irish Soda Bread with Honey Butter - What the Forks for Dinner? 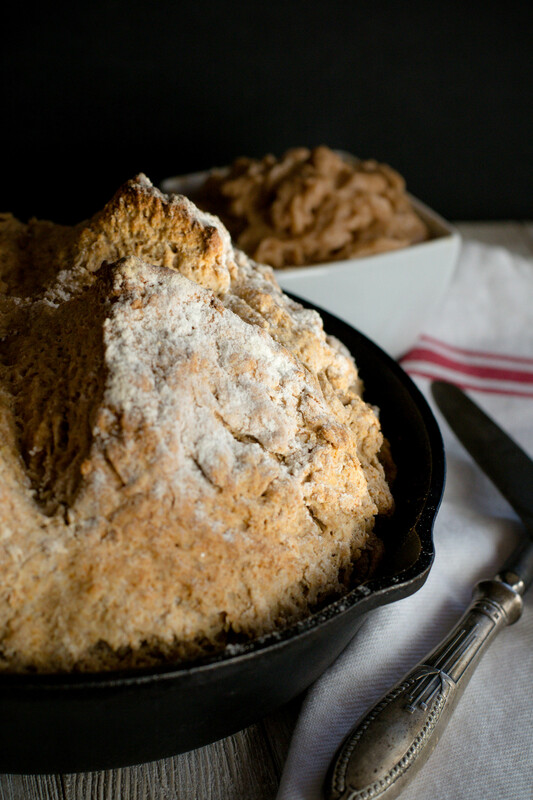 Brown Irish Soda Bread with Honey Butter is a nice compliment to any corned beef and cabbage dinner. St. Patrick’s Day occurs every year on March 17. It observances the of the death of St. Patrick, the patron saint of Ireland. What began as a religious feast day in the 17th century has turned a day of celebrating Irish culture with parades, special foods, music, dancing, and a whole lot of green. My recipe, while not Irish in origin, is fitting for St Patty’s Day. This recipe came from a local restaurant that served what they called Brown Soda Bread instead of a traditional bread basket. It was served on a bread board with a flavored butter. The loaf was the perfect size for two. Although the restaurant is no longer open, I still remember the wonderful bread and the flavored butter that made the bread so extra special. But alas, as many with restaurants, it was not meant to be. Luckily, I was able to have the owner give me the recipe for Brown Irish Soda Bread with Honey Butter. Soda breads are fairly dense, moist and hearty. They consist of four basic ingredients: flour, buttermilk, baking soda and salt. Reaction between the buttermilk and baking soda produces bubbles of carbon dioxide, causing the dough to rise. It is best served the day that it is made, when the crust is crisp from the oven, with plenty of butter. 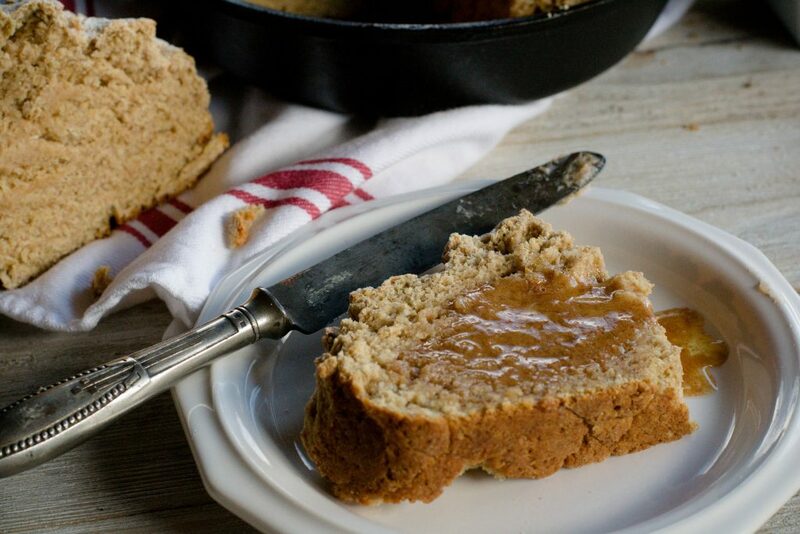 My recipe uses a mix of white and whole wheat flour, and the addition of brown sugar gives a slightly sweet flavor to the bread. 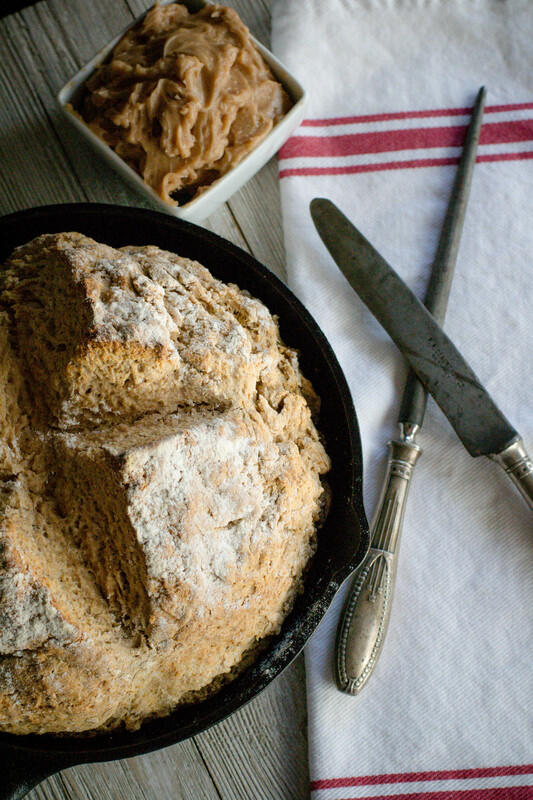 Baking in a cast iron skillet gives an extra crispness to the bottom of the loaf. Now about that butter, sweet but, not too sweet. Fluffy, and easily spreadable. It whips up in a breeze and left overs can be kept in the frig, and used on morning toast. 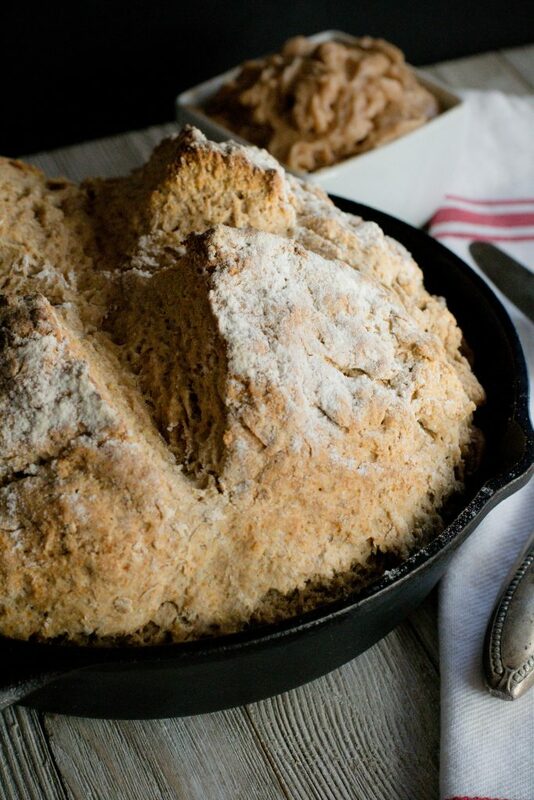 Brown Irish Soda Bread with Honey Butter is great to serve on St Patty’s Day, but also is perfect for any soup or stew. 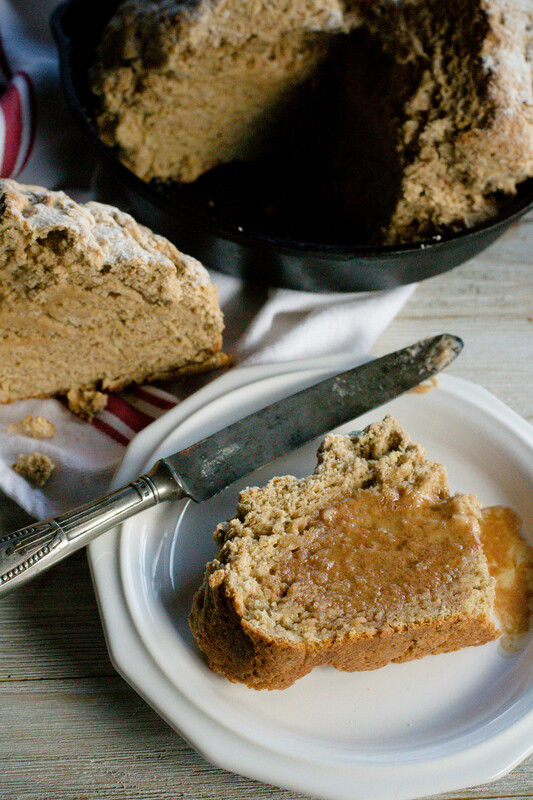 So, anytime you need a hearty, dense bread that is quick to make, try Brown Irish Soda Bread with Honey Butter. In a large bowl,whisk together the flour, salt, sugar, and baking soda. In a small bowl beat egg lightly, add the buttermilk and melted butter. Our wet mixture into dry and stir until combined. Spray a cast iron skillet with non-stick cooking spray. Set aside. Sprinkle a small amount of flour on a cutting board. Scrape the dough from the sides of the bowl onto cutting board and shape into a ball, kneading lightly if necessary. Transfer to cast iron skillet. Sprinkle lightly flour. Using a sharp knife make an X across the top of the dough. Place in preheated oven and bake for 35 to 40 minutes or until lightly golden. Using a hand or stand mixer, whip the butter for about a minute. Add the remaining ingredients and beat until light and fluffy.